The Ancient Chamori Royal Wedding Ceremony is an elaborate and colorful event for the Taotao Tano of Guahan. The ceremony is done with extreme detail to class and status, from a matriarchal concept. Preparation for the ceremony normally begins years in advance with meticulous planning and purposeful staging. The selection of partners comes from many sources, from the natural selection between the woman and the man; the consultation and advice of the elders; and the holistic and spiritual omens gathered from the heavens. The days leading to the big ceremony are normally lively and upbeat. The entire songsong (village) is bursting with activity, very similar to a local fiesta. The women of the village are busy tending to the food preparations. You can hear them chanting in a merry way. The chants come in sequences between the huts, as in a boastful and challenging dictation. There is laughter everywhere. The sounds of children playing near the shorelines. The sounds of children singing and chanting. The sounds of wood drums provide a constant upbeat mood. The sound of the kulos can be heard from distant songsongs, communicating in their own magical way. The village is filled with smoke emanating from the ground (hotnos) ovens. The scent of baked gaddo, suni, d�gu, guihan, haggan, hima, toson, atmangao, uhang, ayuyu, koko fill the entire songsong. The ceremony is performed at the shoreline. The MagaSaina and the L�hi stand near the shoreline awaiting the arrival of the Pal�oan. The entire village population is completely removed from the ceremony as they stand and watch from a distance. The only people allowed near the MagaSaina and the L�hi are the Royal Matuas and the children (famagu'on), who perform chants to acknowledge the Royal event. The sound of kulos and wood drums emanates everywhere, announcing the ceremony. At the sight of the Pal�oan's entourage, which is announced from a kulo in the royal canoe, the entire village comes to a complete silence. The parade of proas, escorting the Pal�oan is slow and majestic. The only sound to be heard is the chirping of the kokos and the seafaring birds. Upon arrival at the beach, the Pal�oan is carried from the proa to the shoreline. The Pal�oan, smiles and raises both arms to acknowledge her family and friends. The Pal�oan is always facing the island, while the L�hi is always facing the sea. This is symbolic of their contrasting spirits. The Magasaina brings the couple together. Goes into a long sermon about the Taotao Tano and the purpose of this ceremony. Finally, he comes to the couple and begins the sacred circumstance. He counsels them on the social and cultural taboos. He prays and chants for their happiness. He adorns them with flower petals to anoint their coming together. Man da�a hit p�gu na ha�ni put esti na pal�oan yan esti na l�hi. Man da�a hit p�gu na ha�ni sa malago na umafahta i guinaiyan-niha. L�hi, dimu p�pa gi inai. Pal�oan, polu i kannai-mu gi hai-�a. Hu guaiya hao ginen i minengmong tataotao-hu. Hu guaiya hao lokkue' ginen i minengmong tataotao-hu. Sa h�gu i pution i linal�-hu. Hu guaiya hao ginen i lineklok i hag�-hu. Hu guaiya hao lokkue' ginen i lineklok i hag�-hu. Sa h�gu i pilan i linal�-hu. Sa h�gu i minalak i linal�-hu. Sa h�gu i anghet i linal�-hu. The MagaSaina signals the Pal�o'an to remove her hand from the L�his forehead. L�hi, na suha i atdas gi ilu-mu. Chule esti na atdas ya un pega gi ilu-mu. 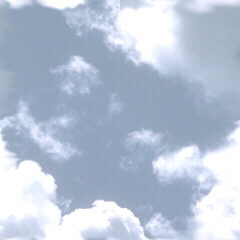 Desdi p�'gu para mona, tungo i sag�-mu, L�hi. Tungo na esti na Pal�oan i mag�s-mu. L�hi, dengnga p�pa ya un ngenge' i adeng-�a. i famal�o'an muma'gagasi i lina'l�-ta. The Maga'Saina called on the Pal�o'an to kneel on the sand, facing the L�hi. He called on the Famagu'on to bring the basket of flower petals. He reaches into the Guagua' and takes a hand full of flower petals and he anoints the couple. 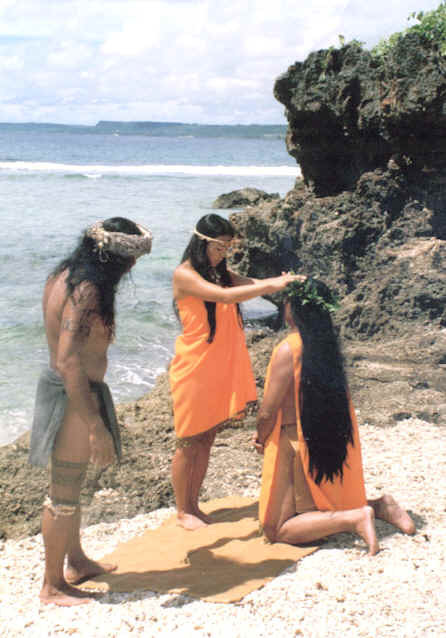 The Maga'Saina now tells the L�hi to remove his Love Beads and to give the Love Beads to the Pal�o'an. He tells the Pal�o'an to wear the love beads. Then he said to both of them and to the crowd. Esti na Bangat guinaiya hu chule' gi Lahi ya hu n�'i i Pal�o'an. Kumekelek�a esti na h�gu na Taotao...maapengga hao. Ya h�gu na Pal�o'an...maapengga h�o, lokkue. Then, the Maga'Saina called on the Famagu'on to bring him the Agimat. He reaches for the ceremonial chalice and prepares to mix the ch� with the special herbs. He then brings the chalice and serves it, first to the Pal�o'an and then to the L�hi. Esti na Agimat ginen i ma�aina-ta siha para hamyu. Gimen esti ya hu sinimiya i guinaiyan-miyu. The Maga'Saina now motions for the couple to stand. He brings forth a young turtle at which time he orders the couple to take the animal out to the shoreline and release it to the sea. Esti i haggan na g�'ga'....ga i ma�aina-ta siha. Hanao ya en setta huyong gi tasi ya hu l�'la'. Sa ginen i lina'l�-�a na manguaha hit. Ginen i lina'l�-�a na manl�'la' hit ni' mann�otao Tano'. The Royal couple takes the haggan to the shoreline and releases the sacred animal. Both return to their appoint space before the Maga'Saina. H�yi giya hamyu ti ninamagof nu esti na dina�a HACHAGUA? H�yi giya hamyu ti ninamagof nu esti na chinetton hinengge? H�yi giya hamyu ti ninamagof nu esti na figan guinaiya? Tachu p�gu kumu ti dinanchi esti na chocho. At this time, the L�hi and the Pal�oan face the MagaSaina and bows. The MagaSaina bows to the couple, as well. H�nao p�gu ya en na mampta i guinaiyan-miyu yan i linala-miya gi tano. The Royal Couple face the crowd and wave. The Royal Matuas pave the way and clear the shoreline. They turn the Royal Proa around and face it out to sea. The L�hi picks up the Pal�oan and sets her in the Proa. He climbs in, both still waving at the crowd. The Royal Matuas push the craft out a ways to give it clearance. And then the Royal Couple sails off into the sunset.